Who manages and makes rules for Candler Park? Candler Park is a public park owned, managed and maintained by the City of Atlanta Department of Parks and Recreation. Accordingly, the Park is subject to the Park Use Rules and Guidelines of the City of Atlanta. The Park features on-site signage from the City of Atlanta Department of Parks and Recreation that are also available you guide your use of Candler Park. What are the hours of Candler Park? Candler Park is open daily between the hours of 6:00am and 11:00pm ET. Pool hours are seasonal and described separately below. Where is Candler Park located? Candler Park is located in the heart of Atlanta's Candler Park neighborhood with its main entrance at 1500 McLendon Avenue NE, Atlanta, GA 30307. Is parking available at Candler Park? Are public restrooms available at Candler Park? Candler Park has on-site parking from the main entrance to Candler Park at 1500 McLendon Avenue NE. The Candler Park Golf Course at 585 Candler Park Drive, Atlanta, GA 30307 also has limited on-site parking. Nearby street parking options may also be available. Candler Park does not currently feature restrooms available to the public. The pool house has restrooms available seasonally to pool users described separately below. How can Candler Park be accessed from MARTA or other public transportation? Most information regarding public transit options to and from Candler Park may be obtained from MARTA. The Candler Park MARTA station is on the blue and green MARTA rail lines and bus routes including Route 102 Moreland/Candler Park. The Candler Park MARTA station is located at 1475 Dekalb Avenue approximately 0.5 miles from Candler Park. To whom should I report emergencies or illegal or suspicious activities? Please immediately report emergencies, or any illegal or suspicious activities to authorities by calling 911.
Who should I contact regarding rules for Candler Park or with general questions, issues or requests like repairs required to facilities, power and lighting issues, graffitti removal, etc.? Most of your questions may be answered by referring to the Park Use Rules and Guidelines of the City of Atlanta. The Park features on-site signage from the City of Atlanta Department of Parks and Recreation that are also available you guide your use of Candler Park. If you still have questions regarding park rules, you may contact the City of Atlanta by calling 311 or the City of Atlanta Department of Parks & Recreation by email at parkscustomerservice@atlantaga.gov or via their Customer Service Call Center at 404-546-6813. Are dogs permitted in Candler Park? Pet policy information for Candler Park may be obtained from the City of Atlanta Department of Parks and Recreation. Some guidelines include the following. All dogs must be on a leash when in City of Atlanta parks, trails and public spaces that are not designated dog parks. Persons with pets must clean up after the pet. No pets are allowed during A, B or C festivals. Owners are responsible for the actions of their dogs. Each dog must be kept within sight of her/his owner and under voice control. When is mowing and other routine landscape maintenance performed at Candler Park? Parks are typically maintained on a 10-day maintenance schedule. Maintenance includes mowing, blowing, trimming of shrubbery, and trash removal. The schedule for landscape maintenance on the Multipurpose Fields at Candler Park is available from the City of Atlanta. For general parks maintenance issues, you may contact the City of Atlanta by calling 311 or the City of Atlanta Department of Parks & Recreation by email at parkscustomerservice@atlantaga.gov or via their Customer Service Call Center at 404-546-6813. Where can I get more information about the Tennis Courts at Candler Park? Candler Park has 4 lighted Tennis Courts operated by the City of Atlanta Department of Parks and Recreation. Candler Park's tennis courts are generally open for play 7-days-a-week during normal park hours. On-site parking is typically available from the main entrance to Candler Park at 1500 McLendon Avenue NE. For maintenance issues regarding the Tennis Courts, you may contact the City of Atlanta by calling 311 or the City of Atlanta Department of Parks & Recreation by email at parkscustomerservice@atlantaga.gov or via their Customer Service Call Center at 404-546-6813. Where can I get more information about the Basketball Courts at Candler Park? 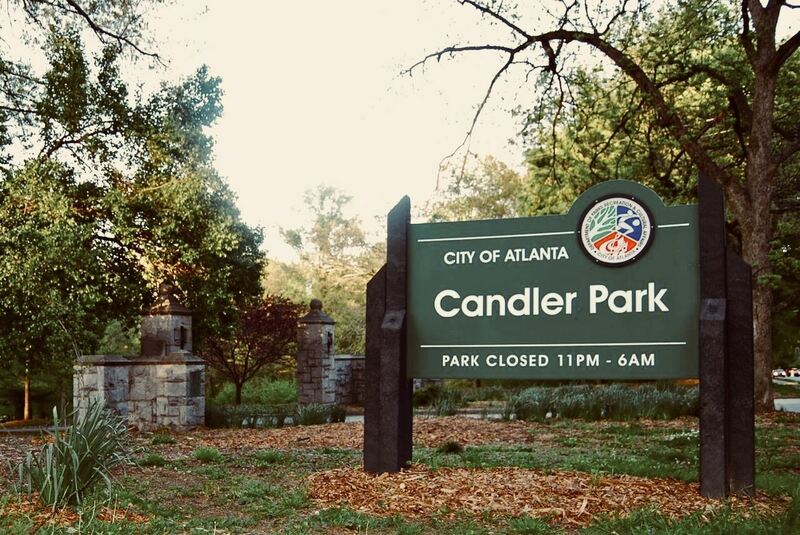 Candler Park has 1.5 non-lighted Basketball Courts operated by the City of Atlanta Department of Parks and Recreation. Candler Park's basketball courts are generally open for play 7-days-a-week during normal park hours. On-site parking is typically available from the main entrance to Candler Park at 1500 McLendon Avenue NE. For maintenance issues regarding the Basketball Courts, you may contact the City of Atlanta by calling 311 or the City of Atlanta Department of Parks & Recreation by email at parkscustomerservice@atlantaga.gov or via their Customer Service Call Center at 404-546-6813. Where can I get more information about the Playground at Candler Park? Candler Park has a non-lighted Playground operated by the City of Atlanta Department of Parks and Recreation. Candler Park's Playground is generally open for play 7-days-a-week during normal park hours. On-site parking is typically available from the main entrance to Candler Park at 1500 McLendon Avenue NE. For maintenance issues and repairs required to the Playground, you may contact the City of Atlanta by calling 311 or the City of Atlanta Department of Parks & Recreation by email at parkscustomerservice@atlantaga.gov or via their Customer Service Call Center at 404-546-6813. Where can I get more information about the Candler Park Pool? Candler Park has a non-lighted, non-heated pool operated by the City of Atlanta Department of Parks and Recreation. The Candler Park Pool is generally open on a seasonal basis during the summer as described below. On-site parking is typically available from the main entrance to Candler Park at 1500 McLendon Avenue NE. All children 12 and under must be accompanied by a paying adult. Children 3 and under must wear a swim diaper. For maintenance issues and repairs required to the Candler Park Pool, you may contact the City of Atlanta by calling 311 or the City of Atlanta Department of Parks & Recreation by email at parkscustomerservice@atlantaga.gov or via their Customer Service Call Center at 404-546-6813. Senior Swim Friday 9:00-10:30am for June and July and 10:30am - 12:00pm for July 27 through August 10. Where can I get more information about reserving a Picnic Pavilion or other amenities at Candler Park? Candler Park has two Picnic Pavilions. The Picnic Pavilions are open-air structures furnished with picnic tables but are not lighted and do not have available plumbing or electricity. You should contact the City of Atlanta Department of Parks and Recreation to check availability of pavilions or other amenities in Candler Park. You may pay a fee and complete the City of Atlanta's pavilion rental application between 14 and 90 days prior to an event to obtain a permit from the City of Atlanta to formally reserve and rent pavilions in Candler Park. Unless a permit has been obtained by another party from the City of Atlanta, pavilions and other amenities in Candler Park are available on a first-come-first-served basis. How can I make a tee time at Candler Park Golf Course? You can make a tee time at Candler Park Golf Course online 7-days-a-week through the City of Atlanta or by calling the Candler Park Club House at 404-371-1260. Where can I get information about Candler Park Golf Course? Historic Candler Park Golf Course, opened in 1927, is a 9-hole golf course located in Candler Park typically open for play 7-days-a-week. On-site parking is typically available from the main entrance to Candler Park at 585 Candler Park Drive NE. The course features 3 sets of tees for different skill levels. Information on the Candler Park Golf Course is available from the City of Atlanta which manages the course. Additional information may also be obtained by calling the Candler Park Club House is 404-371-1260. Where is Candler Park Golf Course located? Candler Park Golf Course is located at 585 Candler Park Drive NE, Atlanta, GA 30307.